Under the pine tree’s boss. A passing angel left upon the air. In 1933, a remarkable woman was travelling the lands of the Arctic, blissfully independent, in search of the wild flowers that grow there. She was so enraptured by her delicate finds that she was often inspired to write poetry about them. She was a botanist, a writer, an artist, and a photographer… but perhaps most importantly she was a free spirit. Her name was Isobel Wylie Hutchison. 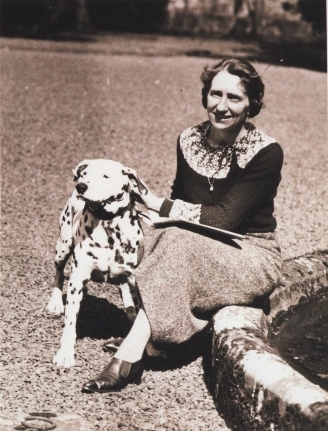 One of five children, Isobel was born in 1889 at Carlowrie Castle in West Lothian. She had a loving, carefree childhood and indulged her talent for poetry, helping to edit a family magazine and keeping regular journals. But her father died suddenly when she was 10, and before she was 20 she had lost both her brothers: one while climbing in the Cairngorms, and the other during the Great War. Taking her grief deep into her heart, Isobel found solace in walking, either alone or in the company of her sisters. 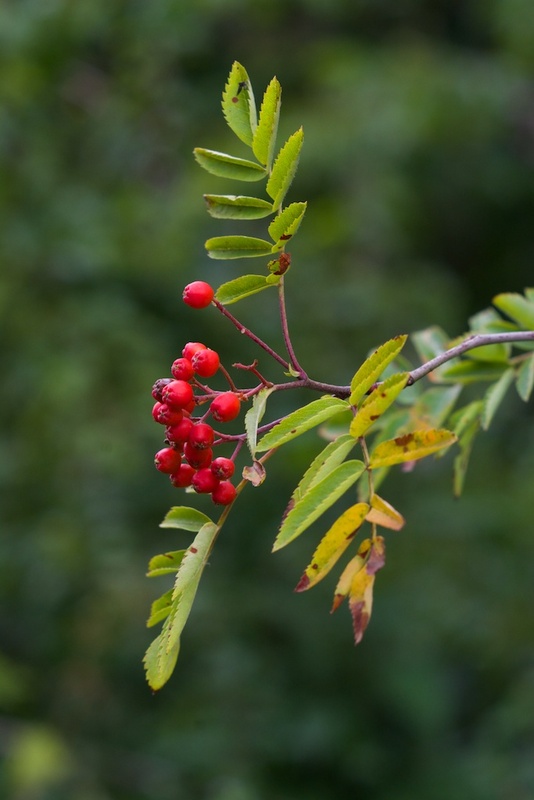 Isobel trained in horticulture at Studley College in Warwickshire, and it was her love of botany that opened the door to her life of adventure. Her mother was busy organising dinner parties with eligible naval cadets, but Isobel had no intention of settling down to a life of domestic boredom. Having made many long-distance treks across Scotland, she was ready to spread her wings and fly further. The lands of the north, remote and serene with their sparkling snowfields and deep blue fjords, had always held a special attraction for her, and instinctively she followed her heart. Iceland, which she visited in 1925, was both a test and a revelation. Having been told that she couldn’t walk from Reykjavik to Akureyri in the north, a distance of 260 miles, because there were no maps, no guides, and it was far too dangerous, Isobel proved everyone wrong and then set her sights on another goal: Greenland. She would have to wait nearly two years for permission to travel there, but when she walked down the gangplank at Angmagssalik in August 1927, she thought it highly likely that she was the first Scotswoman ever to set foot there. Isobel had a lot of learning to do, but her soul opened out in response to the Greenlanders’ simple curiosity, as perhaps it never had in her native Scotland. Welcomed into their houses, she was struck by their poverty and their touching gratitude at her small gifts; she made her first attempts at speaking Greenlandic, joined in their dances, watched them sew and cook, and quickly learned that their thick sealskin trousers were not only decorative but an essential means of protection against biting insects. She purchased a pair, and was photographed proudly modelling them. You can imagine her sense of jubilation and freedom. Returning to Carlowrie on Christmas morning, 1927, Isobel was radiating a joyful new purpose. She was also penniless, but she started to write about her travels and it wasn’t long before her articles and poems were beginning to bring her a well-deserved income. She read some of her poems aloud on BBC radio, and was interviewed for the Daily Post. But true voyagers never settle, and when she wrote in her diary that it was “as though she had never been away”, her wistfulness was hiding between the words. Just over six months later she was back at sea, heading for a settlement in northern Greenland, above the Arctic Circle. In the 1920s, polar exploration was still very much a masculine domain. The South Pole had been reached in 1911 by Roald Amundsen, and soon afterwards Antarctica claimed the lives of Robert Falcon Scott and his four companions. Shackleton had died on board the Quest off South Georgia in 1922. As for the North Pole, the highly flammable Cook-Peary controversy had blown up in 1909, and the question of whether either of them had actually reached the Pole was still simmering. The polar regions, whether north or south, were not for the faint-hearted. A woman willing to tackle such an environment was an unusual and almost scandalous phenomenon, and although she had no intention of trying to reach the North Pole, Isobel was still risking even more than she knew. It was a rough and ruthless environment, where only the hardiest souls could thrive. But all the Arctic traders and navigators she met seemed to sense a kindred spirit on first meeting, as if the fire was visible to them beneath the skin. Unknowingly, through her words and her bearing, Isobel invited respect, and she received it. Isobel and the crew of her umiak at lunch, Tasermiut Fjord, Greenland, 1927. Image courtesy of RSGS. In particular, Isobel won the admiration of the polar explorer Knud Rasmussen, whom she met on several occasions and who visited her at Carlowrie with his family in 1928. In Greenland, it was Rasmussen who helped her with introductions to far-flung communities, easing her path and ensuring that she was known, at least by repute, before she arrived. It wasn’t much, but when she got there in person her friendliness and increasing adaptability did the rest. And then there was Gus Masik. A rugged Estonian who could turn his hand to anything from mining to boat-building, Gus had run away to sea aged 17, and had found a place with Vilhjalmur Stefansson on the Canadian Arctic Expedition. Stefansson had been so impressed with Masik that he said, “There is no man who has been with me in my Arctic work in a non-scientific capacity whom I would rather have with me again.” Gus was now a fur trader and prospector, with a reputation for single-minded independence; if life became too easy, his restless spirit moved him on. Six months older than Isobel, he had more in common with her than it first appeared. It was in Alaska, in September 1933, that Isobel first encountered Gus’s candid blue-eyed gaze. This was her most ambitious adventure: she had already roughed it in all kinds of rusting and stinking vessels, all the way up from the Panama Canal to Vancouver and beyond. At Barrow the sea was rapidly freezing, and Gus took her on board his boat, the Hazel, fleeing east along Alaska’s northern coast while the passage was still open. At Martin Point, on a snow-covered sandspit about a mile long by a hundred yards wide, Gus lived in a simple one-roomed cabin, and Isobel found herself marooned there until the ice became thick enough for sledging. With a family of Inuit people as their only neighbours, and no contact whatsoever with the outside world, all kinds of assumptions could have been made about Gus and Isobel’s relationship, and Isobel was acutely aware of it. Nor would history have judged her as critically as her contemporaries. But she set strong physical boundaries, making it quite plain that friendship was all she was offering. For seven weeks she stayed with Gus, giving herself chores in the daytime and listening to his tales of adventure at night. To his amusement, every day she would take one or two of his sledge dogs for a walk on a leash, to the end of the island and back. 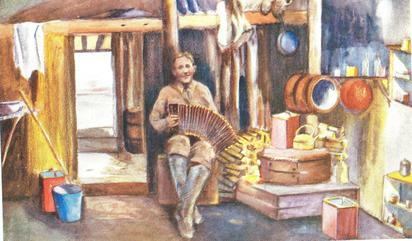 Her painting of the inside of Gus’s cabin, with Gus seated on a box and playing some kind of accordion, reminds me of an illustration in an Enid Blyton book: everything is tidy, clean, wholesome looking, with cheerful colours and no dark corners. Isobel was treading through little-known landscapes, and even if whalers and explorers had seen them before her, none had viewed them through the eyes of a naturalist. When she came home she would go on a dizzy round of lectures, sharing her findings with many academic organisations, including the Royal Scottish Geographical Society. But, like a migrating bird, the north would soon draw her again like a magnet, and she would be off to the land of sparkling snows and dancing lights. She did her job brilliantly well, as she did everything. She collected thousands of plant specimens, preserved and labelled them, and despatched regular parcels by ship to the British Museum. She examined historical sites, traded with the Inuit people, and accepted their hospitality with general cheerfulness and a remarkable constitution. She expressed the beauty of what she saw in poetry, prose and paintings, and she filmed the people of the Arctic as they went about their daily lives. I can’t help considering Isobel in comparison with Isabella Bird. Both had the same wandering spirit that knew no rest; both sought temporary companionship with a rugged pioneer who was living alone and on the edge. Isabella, on the face of it, seems more hard-boiled, ready to wield a gun or a saucepan in self-defence; Isobel, on the other hand, hid her vulnerability behind a wall of ice. As her biographer, Gwyneth Hoyle, suggests, Isobel was like a pure Arctic flower, destined to bloom brilliantly and alone. One of the more spooky phenomena of the Arctic seas was a ‘ghost ship’, which would occasionally drift into sight and cause a great deal of excitement among even the toughest seamen. 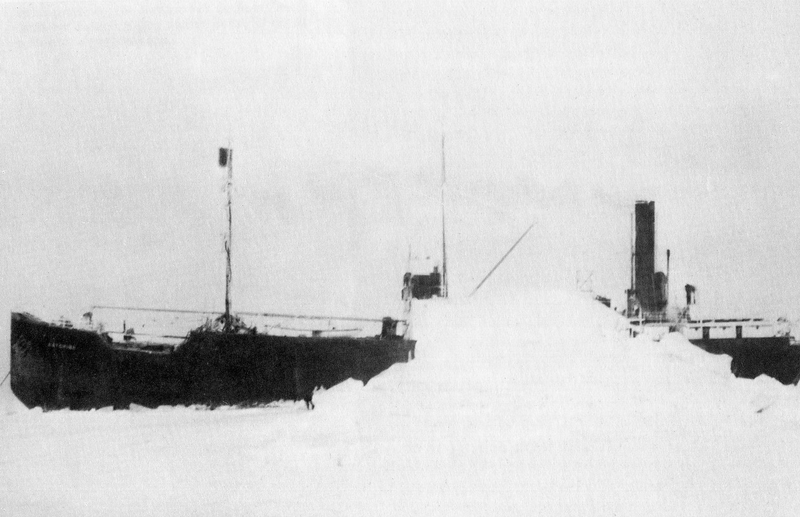 Her name was the Baychimo, and she was in fact a former supply vessel of the Hudson’s Bay Company that had been abandoned by her crew when she was engulfed by ice near Point Barrow in 1931. The crew made it back to shore, but during a two-day blizzard the Baychimo mysteriously disappeared, leaving a mountain of cracked ice 100 feet high. For years afterwards she was glimpsed occasionally, still caught fast in an ice pack, sailing the waters of the Arctic Ocean like the Marie Celeste, creaking in eerie emptiness with no one at the helm. The fact that Isobel gained comparatively little recognition for her mental and physical endurance is partly down to her distaste for drama: she played down the hardships and the discomforts, although she endured them all. It would, of course, have been easier if she had been trying to do something newsworthy, like crossing the Arctic on foot; in the harsh footlights of posterity, plant collecting didn’t quite cut the mustard. The interesting thing about Isobel is that, inside the well-ordered mind of a respectable woman were the instincts of a truly wild child. Her Arctic adventures were an escape in more ways than one. In the early decades of the 20th century women in Britain were still taking their first tentative steps towards equality, and it wasn’t until 1928 that all women over 21 were entitled to vote. For Isobel, who delighted in travelling wherever her spirit took her and befriended whom she wished, the society that she returned to every time at Carlowrie must have seemed stifling. She never married, and it’s tempting to wonder if her solitary travels were prompted by a feeling of being an outsider, an “onlooker” as she put it. But I feel that it might go a lot deeper than this. The title of one of her early compositions, ‘The Calling of Bride’, suggests a kind of enlightenment, and indeed she suffered a period of prolonged depression in 1920, followed by a moment of profound revelation, as if waking from a dream. She spent that winter in a kind of spiritual recuperation on the Isle of Tiree, and from there she gained the confidence to set forth on her own path. Had she been born in a later era, how different her life might have been: but perhaps, had she not had the oppression to push against, the door might never have opened. It is the friction that supplies the spark. Isobel seems to have been a fascinating blend of gentleness, determination, spontaneity, modesty, primness and irrepressible optimism. She certainly had faith in a powerful but unseen guiding presence, watching over her adventures. 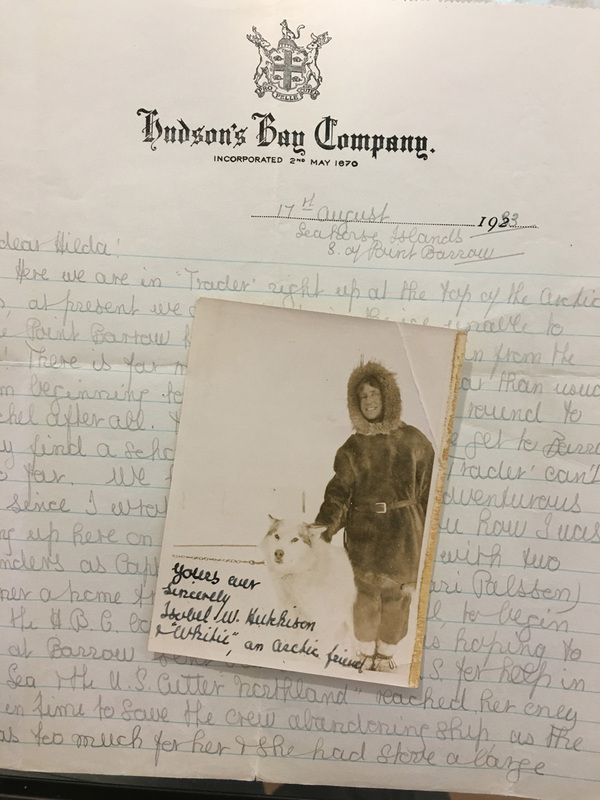 And she forged some warm and lasting friendships: perhaps the closest to her heart was Gus Masik, whom she saw twice more after he drove away from Herschel Island behind his dog team, and they kept in touch by letter until Gus died in 1976. What a legacy Isobel left behind her. 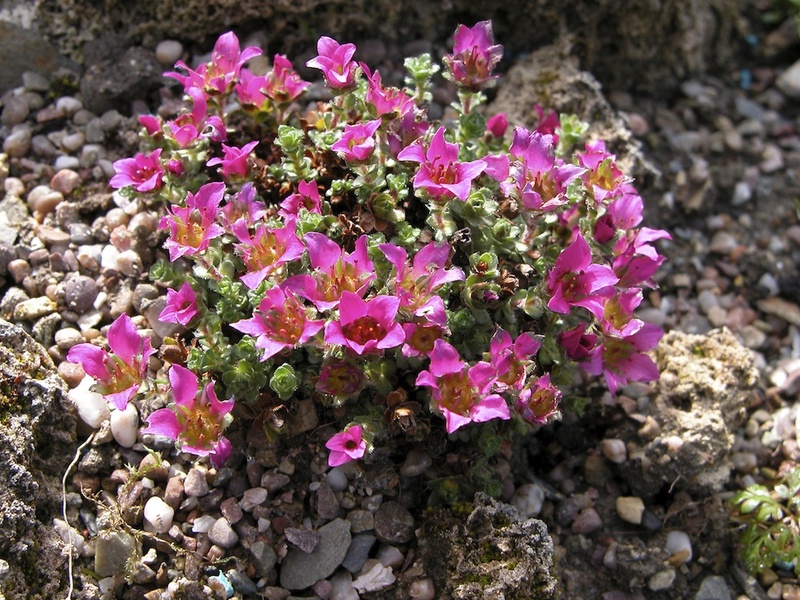 She collected plant specimens for the Royal Botanic Gardens in Kew and Edinburgh, and for the British Museum; many of the artefacts that she brought back from her travels can be seen in the National Museum of Scotland, and the National Library of Scotland holds many of her papers and drawings. Other treasures are held in the Cambridge University Museum of Archaeology and Anthropology and in the Scott Polar Research Institute. The Royal Scottish Geographical Society has a varied collection of Isobel’s slides, films, poetry, paintings, broadcast scripts, notes and books. She was honoured with the Mungo Park Medal of the RSGS in 1934, and was both a Fellow and Vice-President of the Society. She died at Carlowrie in 1982. Quotes from Isobel’s letter dated 17th August 1933, reproduced courtesy of the RSGS; image of it (together with signed photograph of Isobel) taken by Jo Woolf with kind permission of RSGS. Thanks also to the RSGS for allowing me to reproduce a number of other b&w photos from Isobel’s collection. Thanks to the National Library of Scotland for allowing me to reproduce Isobel’s drawing of Gus Masik. Fascinating lady! Thanks, Jo. What drives these women, and men for that matter, is quite beyond me. But I do enjoy hearing about there travels. I had never heard of this remarkable woman, thank you for enlightening me. She must have had extraordinary courage and determination to travel to such wild and forbidding places. I’ve travelled from Reyjkavik to Akureyri and it was adventure enough in the comfort of a 4-wheel drive with a companion who had done it before; the thought of walking that route alone without knowing what it would entail quite takes my breath away. As for Greenland, that’s even more extreme. It’s a place I’d love to visit but I’d be quite nervous about it, even armed with lots of information, photos, maps, etc. It sounds as if she had an overpowering desire to challenge herself, and she was prepared to put aside issues of comfort and control to push herself to her limits. She must have had to rely on the hospitality of others a great deal, especially in Greenland. The relationship she had with Gus is intriguing. Her life story could make a beautiful film, with the picturesque backdrops of Arctic landscapes and scenes set in Carlowrie Castle. That must have astonished you in the museum, it’s funny the way things pop into your life like buses all coming along at once. Good point about the food and hygiene aspects, they would put most people off I think. You did a terrific job of telling her story, I enjoyed it very much from start to finish. What a fascinating woman Jo. Thanks for bringing her to our attention. Most welcome, Susan. I am glad you find her as interesting as I do! Dear Jo Woolf, thanks very much for this interesting account. Do you happen to know whether her diaries have survived and whether it is possible to read them? I would love to know that. Hi Carina, I’m glad you enjoyed reading about Isobel! Yes, some of her journals have survived but are in different places and collections, e.g. at the National Library of Scotland and the RSGS. If you’d like to read more the best thing would be to try and get hold of her books, as they are delightful accounts, although they can be difficult to find. For example, ‘North to the Rime-ringed Sun’, and ‘On Greenland’s Closed Shore’ – beautifully written (in the style of a journal), and very readable. I have just read the interesting article about Isobel Wylie Hutchison in the Herald on Sunday on 21/12/18. Just wanted you to know that I teach classes on Scottish Women’s History for the City of Edinburgh Adult education programme and for the last five years have run a course on “Inspirational Women” in which I included Isobel and her travels, so she hasn’t been completely forgotten. Many of my former students now know about her and were astonished by her courage and daring at a time when women were supposed to conform! Hi Jane, how lovely to hear from you and I’m delighted to know that you include Isobel in your course on Inspirational Women. Fantastic that you’re spreading the word about her! We should be so proud of her achievements, and I’m glad because I feel her spirit is being more widely appreciated, through the efforts of yourself and also (as you’ve read in the Herald) through the event taking place at Carlowrie Castle this week.